Faith in Nam-Myōhō-Renge-Kyō is extremely important. It is not just some mystical phrase but “The Fundamental Law. This is the essence of all life and phenomena”! According to Buddhism, each one of us has within us, at each moment, the ability to overcome any challenge & transform our sufferings into Victory. We have the power to do so because we are inseparable from ‘The Fundamental Law‘. This fundamental law underlies the workings of all life and the universe. WHAT IS THIS FUNDAMENTAL LAW? Nam-Myōhō-Renge-Kyō is “The Fundamental Law and this is the essence of all life and phenomena”. It was defined by Nichiren Daishonin, the 13th century Buddhist monk in Japan. Moreover, upon his teachings, the Soka Gakkai International (SGI) has been formed! Shakyamuni (or Prince Siddharta or Gautam Buddha) lived some 2500 years ago in India. He is considered the founder of Buddhism. Out of compassion, he was yearning to find a means to help people become free of the recurring and inevitable pains of life. These pains are broadly classified as birth, aging, sickness and death. It is then that he actually awoke to this Law and is therefore, referred to as the “Buddha” or the “Awakened One”. The record of his teachings was captured in numerous Buddhist sutras. And the final culmination of these teachings is known as “The Lotus Sutra”. It is interesting to note here that the Sanskrit title of The Lotus Sutra is “Saddharmapundarika“. Eventually, this was translated into Chinese by Kumarajiva and is pronounced in Japanese as “Myōhō Renge Kyō”. Nichiren Daishonin awakened to this law himself and prefixed “Nam” to it. Nam indicates ‘devotion to Myōhō Renge Kyō‘. He discerned that this fundamental law is contained within The Lotus Sutra’s title, Myōhō Renge Kyō. As a result, he established the practice of reciting Nam-Myōhō-Renge-Kyō. As per him it was a practical way for all people to focus their hearts and minds upon this law and manifest its transformative power into reality. “Nam”: to devote or dedicate one’s life. Hence, chanting Nam-Myōhō-Renge-Kyō is a “VOW” to embrace and manifest our Buddha nature. Here, we make a pledge to never give in to the difficulties or sufferings of life. We aim to actually WIN OVER each one of our challenges/sufferings. Simultaneously, it is also a pledge to help others awaken to this law. This Law is already inherent in each of our lives. Hence, we can all achieve victory over all our difficulties. “Myōhō“ : Myō means mystic or wonderful and Hō means the Law. Hence, The Mystic Law. Nam-Myōhō-Renge-Kyō is called Mystic because it is difficult to comprehend the mysticism of this law. Infact when one awakens to this fundamental law in their lives, they are able to bring forth Abundance, Good Fortune, Wisdom, Compassion, Courage and the highest life state of the Buddha (Buddhahood). This Buddhahood has always been inherent in each one of us. It helps us not only to solve our own life problems but also those of others. Most noteworthy is that The Mystic Law, Nam-Myōhō-Renge-Kyō, transforms lives of people from an unhappy state to a life of Supreme Happiness ! It is a metaphor that offers further insight into the qualities of the Mystic Law. Usually, in other plants, the flower blooms first and once the petals wither off, the fruit develops. But the Lotus flower is a unique plant & flower that, unlike other plants, brings forth the flower and the fruit simultaneously.This illustrates the principle of “the simultaneity of cause and effect” . As per this principle, whatever causes we create in our lives, we create the effects also simultaneously. Moreover, as we chant the Mystic Law, Nam-Myōhō-Renge-Kyō, we start to understand that our lives are fundamentally equipped with the high life state of the Buddha. Therefore, to attain Buddhahood, we simply need to open up & bring forth this life state from within us. There is no need to wait for several lifetimes to attain this state of life. The best way is to simply chant Nam-Myōhō-Renge-Kyō and awaken to the innate Buddhahood, within this lifetime itself. “Kyō“: “Sutra”, “Thread”, “Voice” or “Teaching” expounded by the Buddha. While chanting Nam-Myōhō-Renge-Kyō or speaking to others about Nam-Myōhō-Renge-Kyō, our voices resonate with and stimulate our Buddha nature. This Buddha nature is already innate within us, within others and in our environment. As a result, it becomes very important to chant with our entire potential, letting our voices reach out to the Universe and in our own environment as well. “The voice carries out the work of the Buddha, and this is called Kyo, or Sutra“. Even more, as per Nichiren Daishonin, chanting Nam-Myōhō-Renge-Kyō is an act of faith in the Mystic Law and in the magnitude of life’s inherent possibilities. So let us all gather and chant with our voices as the “roar of a Lion” and overcome any & all sufferings from each life in our environment! FAITH in The Mystic Law, Nam-Myōhō-Renge-Kyō , is extremely important! When we chant Nam-Myōhō-Renge-Kyō, it is not just some mystical phrase that brings forth any supernatural powers or creates magic instantly. It is indeed a powerful mantra that enables one to have faith in one’s own unlimited potential as a human being. This, in turn, eventually helps us to live a beautiful and supremely happy life wherein we never stop making consistent efforts to win over life’s challenges! 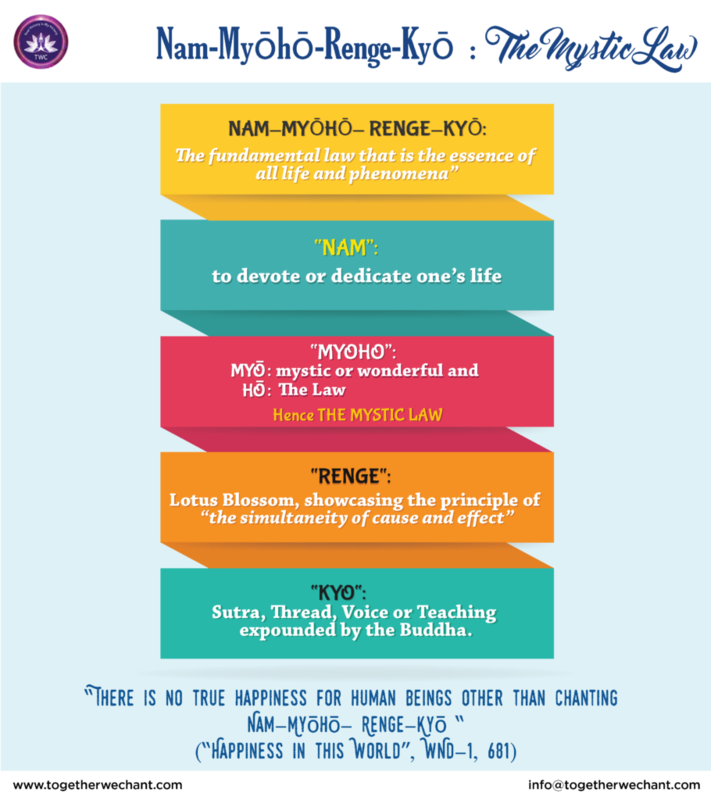 There is no true happiness for human beings other than chanting Nam-Myōhō-Renge-Kyō !! This article is inspired by information available online but is in no way a replica of the same. It is a sincere attempt to share my understanding of The Mystic Law, gained through my own experience of chanting. I am fascinated by the way she explains Nichiren’s Buddhism in such a lucid manner. The depth of her knowledge in this Buddhism is laudable and praiseworthy. She enriches us, empowers in all possible manner. I personally enjoy her posts. Thank You so much! Such kind appreciation coming from an SGI Leader of your stature is my Good Fortune & Abundance. Much gratitude to you! Thanks for your very kind words of appreciation. This is motivation for me to come up with more such enriching posts.